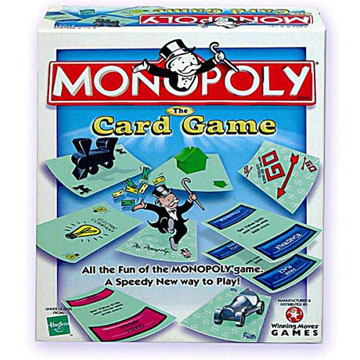 A large selection of card games based on the monopoly board game is shown below. Links are provided to Amazon.com where you can find out more about these games, and if you like, purchase them. Scroll down to see all the games. 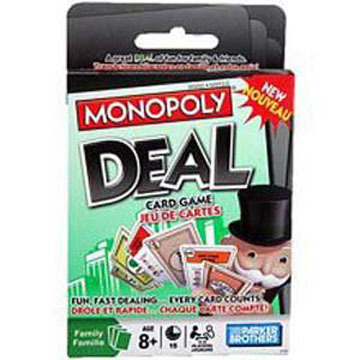 All the Fun of the MONOPOLY game with a speedy new way to play! Be the first player to get all the cards of a color-group and lay down your hand. House and hotel cards add to the value of your set while Token cards multiply your payoff! Build your hand through shrewd exchanges with your opponents. The first player to accumulate $10,000 wins the game! Includes deck of 60 cards, pad of money, card tray and rules. For 2-6 players. The fast-paced, addictive card game where your luck can change in the play of a card! Collect 3 complete property sets, but beware of Debt collectors, Forced Deals and the dreaded Deal Breakers, which could change your fortunes at any time! Fun version of Monopoly for ages 8 and up! © Copyright 2011. All Rights Reserved. Advanced Systems.